The lower part of the body looks more massive. Shoulders are narrower than hips. Wearing a larger size trousers and skirts than tops and blouses. 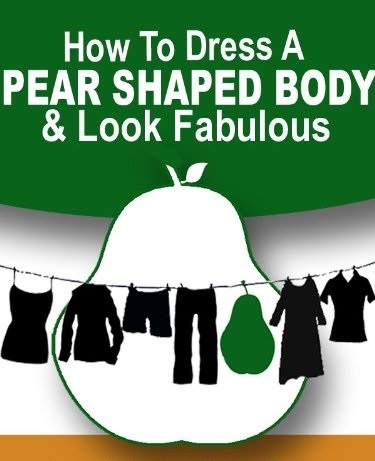 Your tops and jackets has to end above or below your widest part of the body. Make more attention to upper part of your body-wear patterned tops and blouses. Great choice would be ones with horizontal lines, they will make your shoulders look wider and in same time your hips will look narrower. Get blouse, sweater or jacket in bright colour, they are also very fashionable this season! Harmonize figure by wearing jackets and other clothes with constructive shoulders or with sewn in shoulders. Layer your clothes – this will draw attention to your upper body part. Perfect choice would be top with boat or V-shape necklines, also naked shoulders or strapless blouse. Look for tops with 3/4 sleeves or longer – up to the wrist. Blouse with high collar will help you too. Look for skirt which has widen look from the waist up to your knees or just below them. Go for the classic style trousers. They make your legs look narrower and longer. Look for dark coloured denim trousers. Wear heels, they make your legs look longer and your hips narrower. Vertical lines on your suits. Trousers with pockets, patterned with horizontal lines or other very bright patterns. Capri style or ankle length trousers. Handbags, hanging at the hips. Clothes, which makes your shoulders look narrower. This entry was posted in Figure, Harmonize figure, Pear shape figure, Style, Tips You Need to Know and tagged Advice, Clearly visible waist, Clothes, figure, Harmonize figure, jackets, pear figure, Tips how to narrow hips, tops, women figure. Bookmark the permalink.